The world is changing. Constantly of course, but faster and faster so it seems, especially in my world – the (applied) games and gamification world. Where we were ashamed to call ourselves ‘gamer’ five years ago, geek-chic is becoming more and more an accepted ‘style’. Maybe also because of the silicon valley billionaires like the founders of Google, Facebook, YouTube and Whatsapp – the ‘second generation nerds’… with great ideas and great wealth. In Amsterdam it has been a trend to go to ‘dress-up’ parties for some time now and seeing this video below – I don’t think that ‘cosplay’ is far from the next ‘normal’ thing in life. Where maybe now it’s an anomaly to see a stranger in a morph suit… soon we will all walk like heroes…. Gamification: Carrots and Sticks don't work! As stated before and proven over-and-over again: reward and punishment do not work when trying to motivate people to change their behavior. MIT did research and Daniel Pink states it in his book Drive, check out the video below for the essence of his findings in ten minutes. 3. Purpose (give me a reason why I should do this). Every game has objectives and challenges, that make this one easy. 3. Can do (physically and mentally) – in organizational terms this is the execution of your sales proposition. TNO – The leading Dutch research company recently published a report of their extensive research how serious games contribute to the effectiveness of ‘learning’ in an educational environment. The stunning conclusions can be read in the summary below. 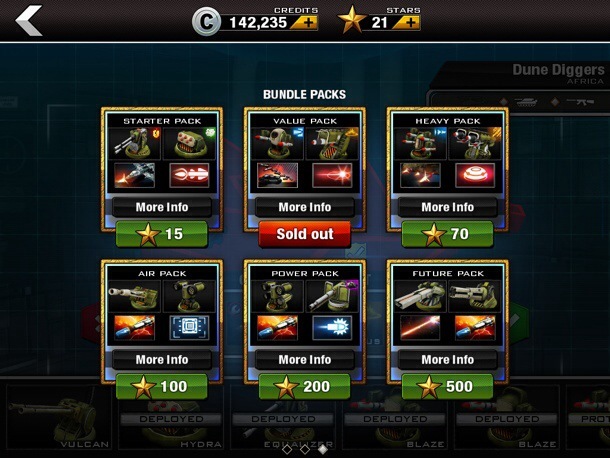 Recently, I downloaded another ‘free to play’ game for iPad. I thought I would give it another try after being disappointed a lot of times, by poor gameplay or cheap ‘engagement’/payment -tricks. 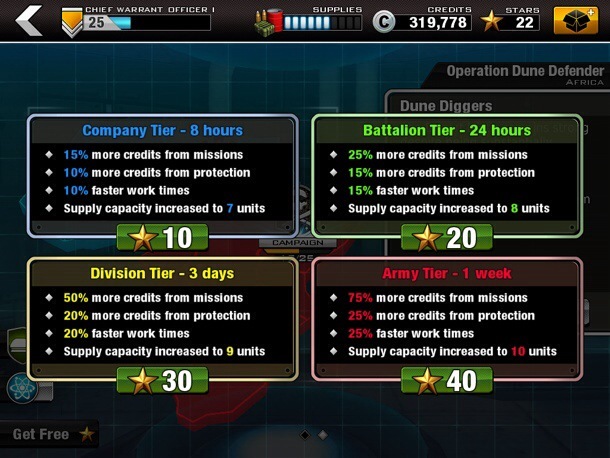 And also because I was looking for a decent tactical / strategy game. So what do you do when you’re looking for a good game? You surf the web, read reviews and download a game developed by a team you know and a publisher that is known for ‘relatively’ great games, right? 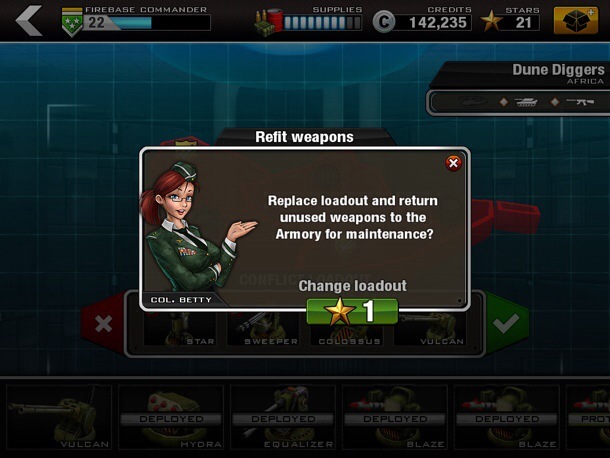 I know I loved ‘Cut the Rope’ recently and ‘Command & Conquer’ in the old days, so why not take a change with ‘Modern Command’ developed by Level Eight and published by Chillingo (Cut the Rope) and EA (C&C and many other titles). You would expect to have a decent gameplay experience for at least a day without having to buy in-game stuff right? Wrong! Here’s how the game works. To be able to progress in the game you need to fight off bad guys in different settings with different guns and munitions. Sounds good. In order to keep up with the increasing difficulty you need to do research and produce your guns, sound logical and excellent to keep the flow going. For this you need researchers, time and money. It all makes sense. But you also need STARS… There is only two ways to gain stars. One is by winning battles, but you need to develop your gear in order to be able to win battles. The other one is buying stars. So this is what we call a ‘catch 22’. You neeed to level up from soldier to sergeant to gain (1 start per level) stars, but you need about stars for every single usefull gameplay element. Whether it be ‘repairing your base’ or ‘replenishing your load out of defensive guns’ or to repair quicker, or to do research, even to buy some decent weaponry you need stars. And the only way to progress in the game – eventually – is to buy more stars…. Now this all would not have been a problem to me if I was able to buy stars for a ‘reasonable price’. You would expect that if you invest 30 dollars in a ‘iOs-game’ you probably bought everything you need. But that’s not the case in this game. You need to buy much more if you want to be able to win more battles with decent guns and amunition. Believe me – I don’t mind waiting for researching items, getting my weapons reloaded over-time, but PLEASE Chillingo and Electronic Arts – let the player choose to play for free (and give a decent play-experience in the game) or let me buy the game in full for 9,95 dollars. Instead of trying to rip off kids. I am an adult and I can pay for hundreds of stars, but that’s not going to improve my playing experience. It will only give me a bad taste in my mouth when I am done playing the game through… rethink the payment structure and do us a righteous proposal a.s.a.p. because I will make sure this message will spread throughout the web… Don’t get me wrong I would even be prepared to ‘pay-per-bullit’ as I proposed to Activision and EA in a previous post, but I don’t want to ‘pay-for-progress’…The hardest part is of course to determine a ‘fair price’ for players… but apparently EA has been giving it some thought – although players do not respond in a positive way (see the comments below). Below some screenshots of the gameplay elements that I think are not right and righteous for players. If you want to know a good example how ‘F2P’ (free to play) works really well in my opinion: Download MMO Justice for iPad or 99Bricks by Weirbeard. Continuously manage these four processes and one day, some day, you will strike gold… and keep improving. This boy’s Arcade is the striking example of ‘passion in play’. From trash to treasure: “Caine’s Arcade” Insert coin! 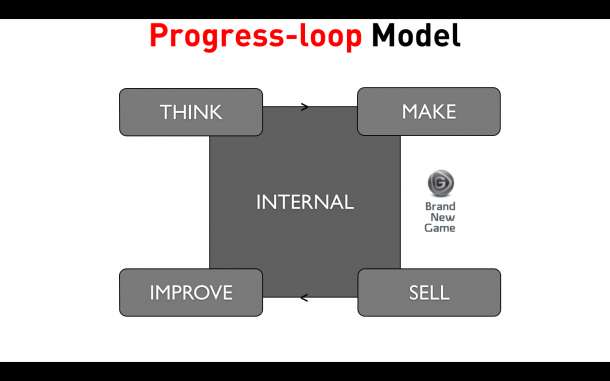 Of course the proces after ‘improve’ is ‘rethink’ – since this model is based on a ‘never ending loop’ of progress… I am still not sure what the name of the model should be… Maybe you can help me out and share your thoughts below? Games are NOT (just) FOR CHILDREN! 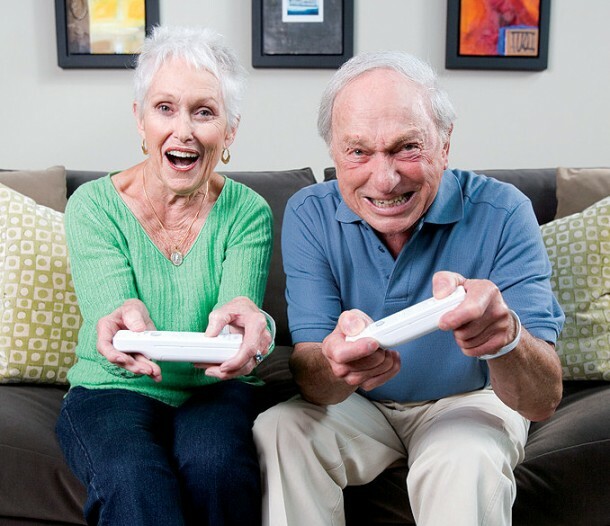 Another report – this time from the ESA – tells us that the 50+ generation is a very interesting target group to focus on! They have two things that are essential to making money in the entertainment industry: time & money…. The following article has been written by a fanatic researcher that conducted research about the effects of in-game advertising. I hope you enjoy it! Even though billions of dollars are spent on in-game advertising each year and everyone in the industry has an opinion on how to use in-game advertising, very little is actually known about the actual effect of in-game advertising. In the study for my thesis I’ve tried to find out more about what in-game advertising can actually do for the advertised brand. 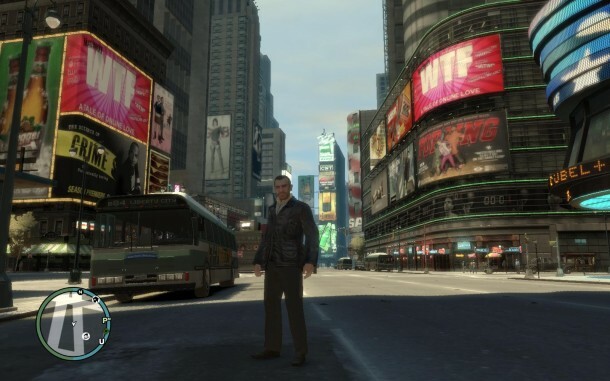 It was already known that in-game billboards can have an effect on memory: if you have played a game, you can sometimes remember or recognize the brand that was advertised in the game. Though this is a good thing if you want to create brand awareness, it is not a particularly spectacular finding, especially considering that not everyone could remember or recognize the advertised brands. 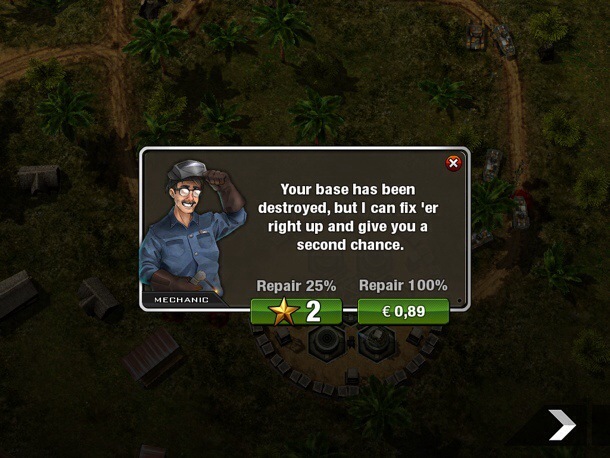 Far from it in fact; the results indicated that in-game billboards were usually poorly remembered and recognized, suggesting that in-game advertising is not very effective at all. This seemed to justify the current cynicism that professionals have about in-game advertising, which I encountered both in news articles and in personal interviews. However, in-game advertising can do more than just make you remember or recognize brands: simple billboards along the track of a racing game can also influence how you feel about a brand. A handful of studies indicated that if you let people play a game with billboard advertising in it and you ask them how they feel about a couple of brands afterwards, they’ll be more favourable towards the brands that were advertised in the game! According to the psychological theory of Dual Attitudes people do not just have a single opinion of something, but people can have two opinions of any given object at the same time. And these two opinions (in social sciences we speak of attitudes) are not always the same: people have both a conscious or explicit attitude and a subconscious or implicit attitude. One of the best examples to illustrate this with is modern racism: hardly anyone will actually admit that they’re racist, because they know it is wrong. So when you ask them if the complexion of your skin should matter for how you’re judged on a job interview, they’ll tell you that it shouldn’t matter; racism is wrong. In practise however people often subconsciously act in a racist way – perhaps because black people are often associated with crime and educational disadvantages. This is why a black person may have less chance to be hired for a job than an equally qualified white person. Knowing that in-game billboard advertising could actually change someone’s conscious, explicit attitude towards a brand, I wondered whether this was also true for their subconscious, implicit attitude. So I set up an experiment where I asked people to play a racing game for 5-10 minutes and complete some tests afterwards. They did not know what I was studying and they did not know that half of them saw in-game billboards with brand A, while the other half of them saw brand B on the very same billboards. I could then measure their implicit attitude with an IAT (Implicit Association Test). In the IAT participants had to complete a series of tasks in which they had to categorize positive and negative terms and brand pictures. For example, participants could be shown the word ‘beautiful’ and if the category ‘good’ was shown in the left corner of the screen, they would have to click the left key. For parts of this test, participants had to categorize both good or bad terms and brands to the left and right corner. For example, participants could have the category ‘good’ and ‘brand A’ on the left side and ‘bad’ and ‘brand B’ on the right side of the screen. In this case, the participants would have to assign good terms and pictures that have to do with brand A to the same category (left). If you are a fan of brand A, you’ll have an easy time assigning good evaluative terms and pictures with brand A on it to the same category and you’ll be able to do so very quickly. If you are not a fan of brand A, you’ll have a harder time placing them in the same category and you’ll be making more mistakes and react more slowly. By pairing both brands with both good and evaluative terms in different parts of the test, this test can figure out which brand is the favourite. According to the IAT, people prefer the brand that they’ve just been exposed to in the game significantly more than the other brand. In previous psychological studies, researchers have already found out that the implicit attitude can play a big role in influencing actual behaviour. Especially at times when people don’t really have the time or aren’t in the mood to think too much about what they’re doing, the implicit attitude will be the main thing to dictate what people actually do. This means that because you’ve played a game with an in-game advertisement for brand A, next time you’re in a hurry and in the supermarket and you want to grab a bottle of soda, you’re more likely to grab a bottle of brand A. Though, interestingly, this effect only occurred for participants in the condition in which they had to play the game on an easy difficulty where they had to race three rounds, as fast as they could, but without traffic to avoid and opponents to beat. In the condition with the hard difficulty, where they had to avoid a lot of traffic and try to beat their opponents, participants were not influenced by the in-game advertising. It did not matter what brand they were exposed to, the results of the IAT indicated that they had no significant preference towards either brand. As to why in-game advertising only has an effect on a lower difficulty I’m not sure yet. There are two plausible explanations: it could be that it requires so much attention to play the game on the hard difficulty setting that people no longer have the cognitive resources to be able to process the in-game billboards. And without processing the billboards, your implicit attitude will not be changed. The second possibility is that because participants were enjoying the game on the easy difficulty setting, they could subconsciously associate their positive experience to the in-game brands. And perhaps they did not have as much of a positive association on the high difficulty setting because they enjoyed it less, because they were more frustrated. Encouraged by the interesting results, I am already working on a part 2 of this study. This time the focus will be more on comparing the effects of the explicit attitude to the implicit attitude and to find out which explanation of the effect of the difficulty level works best. If you want to read more about using games as a marketing tool, download ‘A Brand New Playground’ for free!